Bill O'Reilly's latest book, Manipulating Jesus is already a best-seller. This is a good thing in one respect-- freedom of speech allows for the expression of all sorts of ideas and interpretations, even on the life and ministry of Jesus. In another respect, this is a terrible thing because too many who read O'Reilly's book will actually believe the nonsense that the "no-spin" journalist spins in reference to Jesus' life and the purpose of his death. I have not read Killing Jesus nor do I plan to do so, and so I cannot comment on the substance of the book from a personal perspective. But there are reviewers whose views I trust and who have nothing to very little good to say about it. I would encourage you to read the reviews by Joel Watts, Christopher Skinner, and Candida Moss. My friend, John Byron is in the middle of reading the book and has said that Killing Jesus is killing him. I am hopeful he will post a review on his excellent blog should he survive. Of course, manipulating Jesus to serve one's political and social agenda is nothing new. It has been a problem almost since the inception of Christianity-- the rejection of Jesus' agenda for us and the twisting of Jesus' message and ministry so that he might conform to our easier more palatable way of life. Richard Dawkins states that as intelligent as Jesus was, if he were here today, knowing what we human beings now know in the 21st century, Jesus would be an atheist. Now, it is not the purpose of this post to respond to Dawkins' assertion or O'Reilly's terribly argued book. What I want to highlight is the continual practice of Christians twisting Jesus to fit their particular political and social agendas. Since Dawkins is an atheist, he can be excused; but what is the excuse for those who claim to follow Jesus, those believers that insist Jesus follow them in support of their pet projects and sacred cow conservative and progressive issues? And Bill O'Reilly isn't the only one. 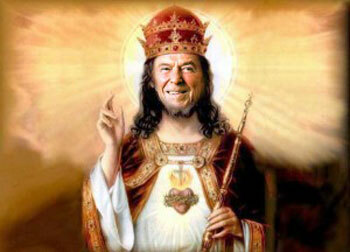 There are those who think that if Jesus were here today he would be a conservative Republican and a Tea Partier. Others assume that since Jesus was concerned for the poor that automatically means he would be down on Wall Street with the Occupiers, as if there is an automatic straight line from one to the other. In the 2008 election, Christian supporters of Barack Obama referred to Jesus as a community organizer, while members of the religious right believed Jesus to be a hawk who would have given his approval to the war in Iraq. Yes, I have read Christians affirm all these things, and if you haven't, you must not be on Facebook. I have to say that it is hard for me to understand the reasoning of any persons who believe any of the above. Apparently I must be reading a different New Testament. Years ago I was at a church dinner during a presidential election season. I was sitting at one table with parishioners who were talking politics and like-mindedly saying that they could not understand how a good Christian could vote for the Democratic candidate for president. A few minutes later I was at another table as I was making my "pastoral rounds" that evening, and those folks, also talking politics, were having the same conversation... but they couldn't figure why any caring Christian would vote for the Republican. Trying to fit Christian beliefs into a specific political stance seems to be putting a square peg into a round hole—it just doesn't fit.... I think it's fine that people bring their religious convictions into their political decisions, as we should with every aspect of life. However, I've become skeptical that there is any one "right" way of doing this. Moreover, I’m uncomfortable with any message, either explicit or implicit, that suggests that "if you're a Christian, you should be a _______ (fill in the political party)." Wright is certainly correct, but I do not want to leave the issue there. What happens all too often is that someone basically says that Jesus would not be Democrat or a Republican, and all thoughtful Christians on both sides of the political aisle agree, and then they proceed to go back to their Democratic and Republican corners as if such an important affirmation determines nothing. So we agree that Jesus would be neither, but most of us his followers choose to be one or the other. Surely I cannot be the only one that sees the problem here. I have come to believe that as long as we believers identify and line up too closely with one side or the other, with either the Republican Party or the Democratic Party, Christians will unintentionally eclipse the politics of the God's kingdom and our prophetic voice and witness as the church will be undermined if not completely muted. I am well aware that among Christians I am embracing a minority opinion. But as long as we divorce the work of God's kingdom from the king and as long as we separate the work of the kingdom from the church, we will continue, with good intentions, to make Jesus subservient to our agendas, while the church becomes nothing more than the handmaiden of state power. Unfortunately, Christendom is alive and well... and Christians on the left and the right are in it up to their activist armpits. And that will not change until the kingdom and the church are once again intrinsically related to what God is doing in the world in King Jesus. Richard Dawkins wants Jesus to serve his agenda. We may excuse him for that. Bill O'Reilly thinks Jesus was crucified because he was a conservative tax cutter. We may give him somewhat of a break because he is nothing more than a journalistic talking head. But we Christians who are serious about getting Jesus right are without excuse in making Jesus subservient to our wills. We should know better. And by the way, I would remiss if I fail to mention that there have been scholarly treatments of the life and ministry of Jesus that have grossly distorted the historical Jesus all in the name of scholarship. They are definitely without excuse. Manipulating Jesus... that sounds like a good title for a book. Note to Bill O'Reilly-- let someone else write it. Thanx for this. It is difficult to separate our favored positions from our faith. Each can say that they are simply following Jesus. That they are 'called' to act in a conservative/progressive/fill in the blank kind of way. Perhaps, Mother Teresa had it right. Simply serve. Be Christ's presence. Leave the politics to the politicians.